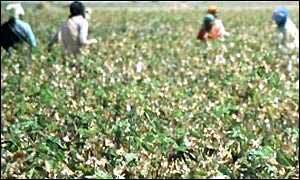 Cotton crops in India that were genetically modified to resist insects have produced dramatically increased yields. The farm trials also showed that the novel plants needed significantly less pesticide treatment. The details of the research have been published in the journal Science. This study may be especially promising for small-scale, low-income farmers in developing countries, it is claimed. These farmers often risk large, pest-related crop losses because they cannot afford to use the pesticides available to larger farms. Field trials were carried out at 150 farms in three of India's major cotton-producing states. Scientists grew cotton that had been modified to incorporate a gene from the bacterium Bacillus thuringiensis (Bt). This makes the plant tissue toxic to three species of bollworm that plague crops in India. In the study, the BT cotton was grown next to two plots of unmodified crops. The results were dramatic. There was an average improvement in yield from the BT cotton of between 80 and 90% - far more than in similar field trials in China and the United States. The report says there are two reasons for the success of the crop. Bollworm, and other pests, enjoy India's sub-tropical climate, and tend to breed rapidly. There is also a much lower use of effective pesticides in India. The researchers say the crops are not the only source of food for the bollworm. This means it will take longer for the pest to develop a resistance to the new crop. Martin Qaim, Assistant Professor of Agriculture at Bonn University and lead author of the report, told the BBC: "We expect the benefits to last for quite some time." The authors say the results are transferable to other parts of the world and to food crops which sustain similar types of pest damage. There has been a strong lobby against genetic modification in India. Environmentalists are concerned about the damage GM pollen could do to crop diversity if it "contaminates" the 600 or so natural varieties growing in India. They say any short-term gains in yield from GM cotton would undoubtedly be lost as the insects developed resistance.